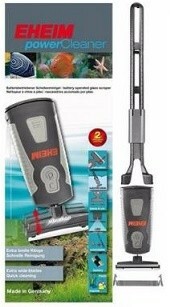 Power Cleaner;Extra Quality-made by Eheim Germany. With the battery operated EHEIM glass scraper any stained or calcified glass panes can be quickly and easily cleaned. Even the most stubborn stains such as green spot or brush algae can be effortlessly removed. This glass scraper to the stack allows a quick and efficient cleaning of the glass of the dirty aquarium. Even the most difficult stains, such as small spots of calcareous algae, can be easily removed. Vibration for better dirt removal. Exceptionally clean result, Can be used in fresh or salt water, Easy to Use, Can be used as a short handheld device for cleaning small areas or with the extension piece (included) for larger areas and deeper aquariums.